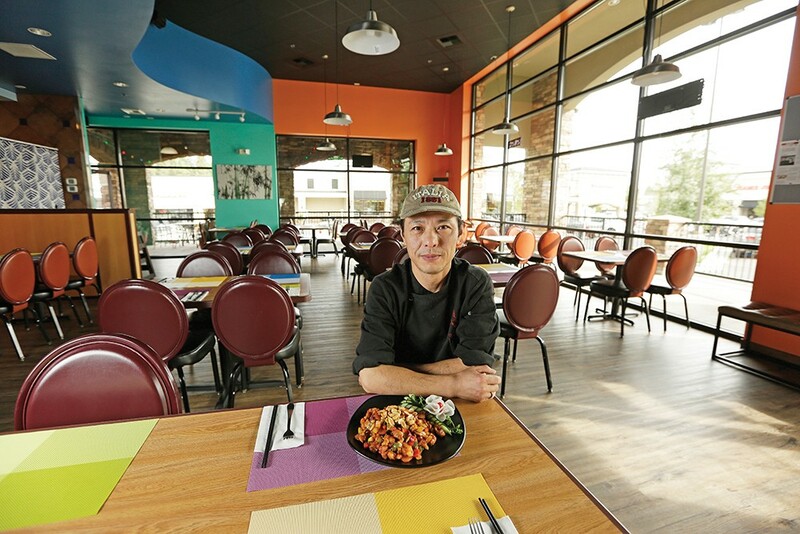 Jianjun "JJ" Lu, aka Chef Lu, serves family style, authentic Chinese cuisine at his South Hill Asian Bistro. It's just before opening hour at Chef Lu's Asian Bistro, and the clink of tables being set mingles with chopping and other kitchen sounds — a pleasant buzz at this new South Hill restaurant opened by Jianjun "JJ" Lu and his wife Monica Zhang earlier this year. Then Lu flicks a switch and the real power of the place roars to life: fire. 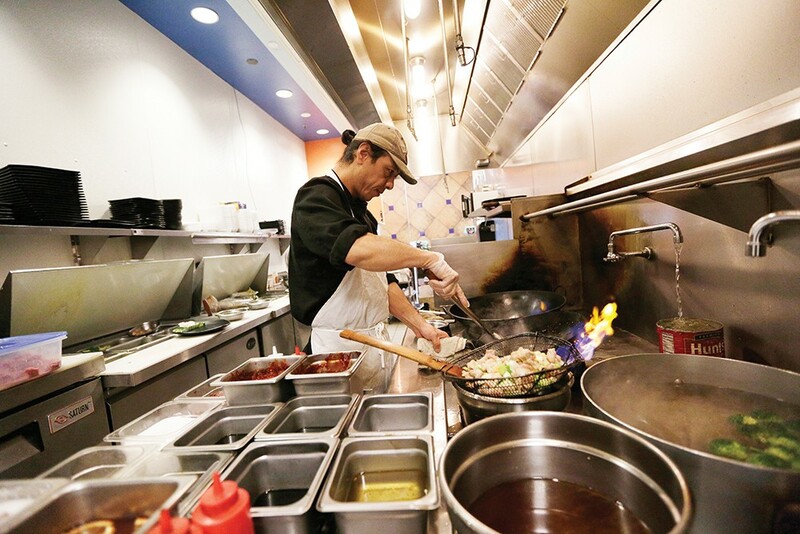 High heat is essential to seal in moisture, making vegetables crisp and meat tender during so-called stir-fry cooking, says Vincent Cai, translating for Lu, who began his professional chef training in Tianjin, southeast of Beijing, at age 16. After cooking at various hotels in China, Lu emigrated to the United States, settling in Eastern Washington around 10 years ago. He worked for several restaurants and ran Chinese Gardens in Cheney before opening Chef Lu's. At Chef Lu's, the range-top has been modified to accommodate several woks — the familiar dome-shaped pan that dates back several thousand years. Chef Lu's largest is 18 inches across and surprisingly lightweight for cast iron. Elevated rings over the gas burners provide a snug seat for the wok, directing flames up and outward. Heat is vital to wok hay (aka wok hei), the breath of the wok, which author Grace Young details in her 2004 book, Breath of a Wok. In it, the American-born food writer traveled to China, returning with advice for those interested in wok cooking. Chinese-made cast iron is preferable, although it can be fragile if over-handled, while carbon steel is a good alternative, including modern woks featuring flat bottoms to allow for cooking on electric stoves. The wok is only one part of the equation, however. The sauce is the key, translates Cai. "In real Chinese cooking, sauce is not pre-made." Often it is mixed and added to the dish on-the-fly as the dish is cooking, not just poured on top afterward; a process that allows the complexities of the sauce flavors to become infused into the other ingredients. In Lu's kitchen, a three-shelf sauce cart is crammed with ingredients: several types of soy sauce, including one infused with mushroom, containers of salt, sugar, cornstarch (for thickening sauces), chicken bouillon, chili sauce and oyster sauce, as well as onion-infused oil and orange sauce, both scratch-made. Lu also uses cooking wine, which is made from fermented rice and can vary from sweet to dry and from pale to amber to red, Shaoxing being the most popular brand. In Spokane, Asian market sources include Best Asian Market, Vina Asian Market and Asian World Food Market, but some ingredients might also be found in higher-end grocery stores and, of course, online. 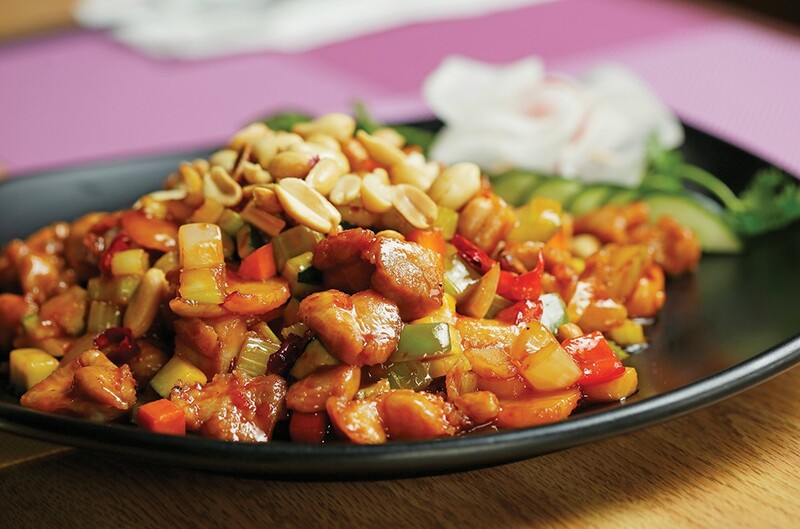 Chef Lu's menu is a mixture of contemporary dishes, like those one might find in a conventional Chinese home; traditional, somewhat Americanized dishes; and spicy Szechuan cuisine. A separate area is dedicated to sushi. In addition to introducing local audiences to more authentic Chinese wok cooking, says Cai, Chef Lu's offers a more social, relaxed way of eating for interested diners. Because dishes have different cooking times and are all scratch-made, he says, they are ready at different times, which encourages ordering multiple dishes and sharing them. Unfortunately, Cai notes, the chef has to remain in the kitchen tending the woks over their flames, so he rarely gets to enjoy his food while it's hot. Flavor is sealed in quickly in this dish, which allows for many variations: remove chicken to make it vegetarian; add or change vegetables depending on your taste and what is available. Even the heat level can be adjusted according to how many peppercorns and peppers are used. Serve as is or add rice for a hearty meal. Mix together with a little water and set aside. Mix oil, wine and cornstarch together in a container. Add cubed chicken and stir to coat. Let rest while you assemble ingredients for rest of the stir fry. Heat cooking oil in the wok until it is shimmery but not smoking. Add chicken cubes and cook, stirring, until color is golden (3-5 minutes). Remove chicken cubes from the wok and set aside. Add a little more oil to the wok, then add the vegetables and stir fry for a minute or two. (Tip: Put vegetables like carrots that take longer to cook in first.) Remove vegetables and set aside. There should still be a little oil in the wok. Toss in the Sichuan peppercorns, which will infuse the oil with heat. Remove these after a minute or so; they are only used to add heat to the dish and are not eaten. Add green onion and dried peppers to the wok and stir fry for a minute or two. Add the sautéed chicken cubes and vegetables and stir fry a bit. Add the sauce, turn up heat and cook while stirring for a minute or two. The sauce will thicken and coat everything nicely. Add peanuts to finish, stirring and turning off heat to serve the dish.